Perhaps it's time to move on and let go, the things I've held so close. Sometimes courage is learning how to spread your wings and fly not to be held down by your feelings from the past. Maybe, I'll start to walk away somehow from this thing that I've held onto for so long. I'm just glad I was able to be part of it somehow. I wonder if this is the right thing to do. I wish we could have met in a more forgiving time. An unexplainable need to express oneself, but the unfortunate lack of ways to do so. The fumes of anger swirling about not to be extinguished anytime soon. A single source of light kindled by kindness deep within. Keep those eyes open, feet moving, and mind working. I wrote this a few years ago. I've always willed myself to believe that everything happens for a reason, and whatever the reason, it may not materialize right away, keep doing your best! I've been given the opportunity to work with wonderful and talented people who I think would greatly influence me for the better, although still an intern at the moment I hope I'd be able to be a great addition to their team. I'm struggling a bit in managing my time between this opportunity and the other jobs I have. I still have to make a living to be able to sustain myself and to at least help out my grandparents who have given me so much. The daily struggle of commuting to this wonderful place via MRT takes a great toll over me, mentally and physically lol I know! I don't have the right to complain, since there are countless people who have been doing this since forever. I KNOW I MADE THE RIGHT DECISION. I FEEL IT. It's just so hard being so small and feeling like the people around you are out to get you hahaha! Anyway, I digress, I finished reading "Daughter of The Blood" by Anne Bishop. Someday, I hope to be able to write novels like these, stories that would move people, put a smile on the their faces, sympathize with the characters and let the readers experience a whole new world apart from the all too familiar reality they're used to living. I hope everyone is doing their best despite the struggles they're going through! I was once a victim of the ever elusive "self-pity". I'd think of how other people had it better, how my life sucked and that I should never have been coerced into a world so unforgiving. It took me a long time to get over myself and to look at the brighter side of life. In a way, I was lucky, it only lasted through high school and my university days. Some people don't grow out of it and often times get swallowed into a whirlpool of negativity. I still do get down, but not as bad as when I was younger. Nowadays, when I feel gloomy I sleep on it hahaha! It passes. I think what helped the most was the decision to be kind. Sometime back in university, I decided that the only way I'll be truly happy and successful was to be kind. I even used that as my tagline for my fashion design thesis (if you read my blog you'll know) "If you are KIND, you are BEAUTIFUL" and I believe that through and through. I drowned in my self-pity when I was younger and it was very selfish of me, I thought only of myself and not the people around me. Times may still be hard now, not everyone as kind as I hoped them to be, I haven't realized my dreams yet, but these things take time and A LOT of effort. The harder the road the more fulfilling the destination. You'll meet a lot of kind people, everyone must have it within themselves, deep, deep, deep, down like a diamond hidden within the rigid stone walls. So, pull yourself out of the sea of misery and walk on, believe in yourself, believe in others, be honest, be kind, and you'll see that you're not alone. Your Family is Your Home. I may not be able to stand my family, but that does not make me love them any less. They are kind people, I know they mean no harm, and are just trying to help in ways that they are familiar or accustomed to. My family and friends know me as a very optimistic person, but they may not know that I do breakdown sometimes. The reason why I do my best to think positive every single time is because that way I can stay calm and not panic. Who gets things done well when they panic anyway? Going back to the main point, I can't stand people who spout negativity ALL THE TIME. It's so hard to introduce new ideas to them because they'll end up nitpicking every detail that could go wrong from the start, without even considering the good that may come out of the said idea. It weighs me down and makes me feel incompetent and adds more pressure to my low self-esteem. I know, you may be thinking that they're just worried that I might fail, but so what? if I do fail, that just means I can start again and learn from my failures, but surely with supportive people behind me the fall would not feel so bad compared to when people have been bringing you down from the start. So, let's all start supporting each other from the beginning, some ideas may not succeed in the beginning and may not succeed ever, but maybe failing at it is the way for you to find and succeed at an even better idea that's meant for you! Think of all the pros first and then the cons later, it always helps to feel better about something first before breaking in the negative things about it which you could totally work out! Believe in others and believe in yourself! (ironic how that's coming from me as I have low self-esteem BUT THAT'S OK). You cannot choose your family, but you can choose how you treat them (always be kind) and someday you'll find that place where you'll be able to call the people there your family and your home. I stated in my previous blog post that I was not happy, thinking back to it, and this is going to sound very cliche, but I realized that there were other people who are in far more complicated situations than me right now. I thought to myself, "Am I in the position to be complaining? when there are others who are fighting a disease? when there are others struggling through hunger and poverty each day just to survive?". I may not be happy, but I don't seem to have the right to be complaining about it. Although, I did just want to be able to express what I currently felt, it may not be so bad to let it out from time to time than to have it all bottled up. I'm so tired, so, so tired. I just want to keep my eyes closed and sleep for a long time, but when I do I start to think about all the dreams that will remain unrealized, so I won't give up on this life. I won't be a coward and face everyday with a smile. Her breathing falters, she slips in and out of consciousness. Is there no one who can wake her from this nightmare like reality? they will forever remind her of the frail little girl she once was. No longer will she follow blindly. Oh, universe, help this world that has lost its way. She wondered how it was so, how she could not think of any other, how it was so difficult for her to make amends with the past. It was not always how it was, there used to be no thought of such things, but now it troubled her. She could not understand why the thought has lingered for such a long time. She knew that what she wished for was impossible to attain, but if there was even the slimmest chance of it still coming true she held on to that. There must be a reason why her mind and her heart refuse to open up for any other. The universe knows she tries her best to move forward, but within the void of her subconscious something tells her not to let go. Have you given any thought of your future? Have you settled with your past? To forgive yourself is not a selfish act as long as you change for the better. You'll see, the story will unfold further. One must understand, the harder the path you take, the more worth it the destination will be. Right now, there are things I wish could have been different. I am thankful for what I have, but I am not happy. Although, I am sure, this is just a phase. To grow up in a supportive environment have always been something I long for, to be able to express your opinions, and your emotions, and not be critically criticized about being how you are. But we're all long past that, what we can do now, is to nurture ourselves, and make ourselves better people, than how we were once. 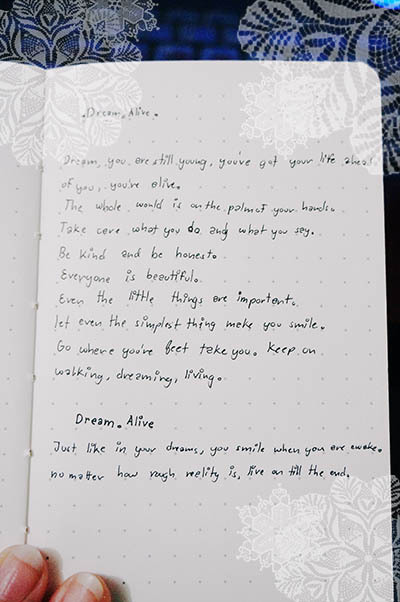 Dream, you are still young, you've got your life ahead of you, you're alive. The whole world is on the palm of your hands. Take care what you do, and what you say. Be kind, and be honest. Even the little things are important. Let even the simplest of things make you smile. Go where your feet take you. Keep on walking, dreaming, living. Just like in your dreams, you smile when you are awake. No matter how rough reality is, live on till the end. There are people who seem to have gone through a lot of painful experiences, but produce such wonderful things. Often times, they voice out all the good things you can find around our planet, the amazing people you'll meet, and the adventures you'll brave. He wrote such soothing lyrics, you'd think he has lived for a long time. The stoic expression on his face hides the hurt he's held in. His life like a spinning wheel that has no end. Staring up at the sky, he wonders when he can leave. He tells his story through his songs that are hard to believe. Letting go of the people he's grown close to was always the hardest. Like a spinning wheel, his life keeps on turning, an endless cycle. On this planet we live in, we've got to stand as one. Pull one another up, not down. Let's all be kind to each other. We've only scratched the surface of this life we're living. None of us will remain the same. you're alive, and leave a few footsteps for others to retrace. Copyright © P a n d a P a n d a P a n d a All Rights Reserved.